That’s the impression you get from reading the latest story by Tom Bergin of Reuters, who has done a detailed and excellent exploration of the UK’s recent moves to become more of a tax haven for multinational corporations. The harm inflicted on taxpayers elsewhere? Enormous. Just look at the effect on one single U.S. oil company’s tax bill, with an effective tax rate that has been slashed from 34.6% in 2008 to 3.3% in 2013. The benefits for Britain? Peanuts. In job terms, in fact, it looks as if there have been net job losses for Britain. In tax terms, there has been almost nothing directly to show for it either. But let’s not forget – these are gross, not net benefits. This is before you start taking into account the giant tax losses that the UK is suffering as a result of trying to be – to use that awful weasel word – ‘competitive’ on tax. Using tax to try and lure the world’s hot money and incorporation business involves slashing taxes on multinationals who were never planning to leave, or those that were planning to come here anyway. 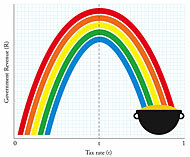 Richard Murphy estimates that giveaway to add up to some UK£10 billion (some US$17 billion) per year, while the U.K. government is expecting the headline tax rate cuts alone to cost £7.8 billion a year by 2016/7. That giant giveaway to the mostly wealthy shareholders and bosses of multinational corporations has to be paid for by someone else in the economy. On this evidence, the UK’s tax moves have been a colossal failure so far – even before one starts to consider the harm wreaked on the United States – not to mention the estimated US$7 billion annual costs to developing countries, as estimated recently by ActionAid. For now at least. This won’t last too long. In fact, this particular ugly cat is already emerging from the bag. What his article does is to note that Britain is currently enjoying an economic recovery, and then goes onto explain that this must be – it can only be – because of these corporate tax cuts. It isn’t anything to do with the gigantic and long-term fall in the value of the Pound Sterling that happened in the financial crisis – nor is it the stoking of a gigantic party in the U.K. housing market, nor is it the fact that after a deep recession there will be growth. No: the growth has to be because of the tax cuts, and all other factors must be ignored. Well, we’ve got a little graph for you, Mr. Warner, from a wonderful website called Spurious Correlations. That correlation is so close – there just has to be a connection! Cheese causes bad dreams, right? And that causes bedsheet issues, of course! Get Jeremy Warner and the Telegraph to investigate, straight away. Read more about tax ‘competitiveness’ here. And see the ‘tax wars’ section of our website, for further details.